You may not use the return box to return any AV materials to prevent the materials from damaging. Please return all AV materials to the library counter. Upon return, please make sure all contents are there, including commentaries if there are. Please rewind cassette tapes when you return. Your coopration is appreciated. If you are overdue on your checked out items, the library will contact you by phone or by e-mail. If you fail to return the checked out items despite receiving the aforementioned reminder, the library will issue a demand notice. If you are overdue in returning checked out materials, your library card may be temporarily invalidated. Please try not to become overdue in returning your checked out materials. You may return the materials from your house by percel. Delivery charge is 500Yen from anywhere within Japan. If you wish to use this service, please apply at the 3F library counter. After registration, you'll receive an invoice and a special bag. 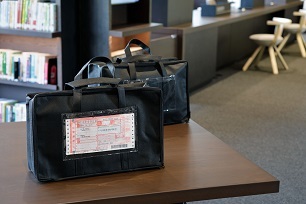 When returning checked out materials, enclose books in the bag and contact Yamato Transport Co., Ltd. for collection or take the bag to the nearest convenience store (agent for Yamato Transport) or regional office of Yamato Transport. Please ensure that the items you are returning will be delivered to the library on or before the due date. Items that are too large to fit in the bag cannot be returned using this door-to-door parcel return service. iPads are provided at certain locations throughout the library to facilitate you in searching for books and materials. You may search from book title, author etc. You can print out your search result, on which a location map of the library will be also printed to facilitate you in finding the book on your own. You can also search materials from your PC or smartphone by accessing the Shunan Tokuyama-ekimae Library homepage. Please don't hesitate to ask us for help. Daily newspapers may be viewed at the 1st floor. Copies are not be allowed on the day. Please come to the 3F library counter for copies of the past newspapers. *Newspapers are archived as from February 3, 2018. The latest editions can only be read in the library, but you can reserve them. Back issues may be checked out. If you lose or damage library materials, we may ask you for the new copy or a compensation. For lost AV materials, the price may cost more than the retail price. If you cannot find the book you want to read, or the book is checked out, you may make a reservation or a request. You may reserve up to 15 items, magazines or documents and up to 5 AV materials, picture-story shows or large picture books, but not to exceed 15 items in total. Please visit the library counter for this sevice. If you reserved to pick up from the Bookmobile, you will you have pick up on its next visit. If you don't pick up within the given time, your reservation will be canceled. In addition, you may make a reservation/request from the Tokuyama-ekimae Library website. Search for the book from the "Search" section, and log into your MyPage and make a reservation. To log into MYPAGE, you need a password, so please come to the library counter. Any material that Shunan Municipal Libraries (Chuo, Shin-Nanyo, Fukugawa, Kumage, Kano, Mobile Libraries) do not have may be borrowed from other prefectural or municipal libraries. Please feel free to ask the library. Any resident of Yamaguchi Prefecture may request the library to purchase one library material (maximum price set at 5,000 yen) per month. We apologize in advance for not to be able to fullfill all your requests. This service makes it possible for you to check-out Chuo Library's materials at the Tokuyama-ekimae Library on the same day that you make a reservation, provided you make your reservation before the prescribed hours. This service is unavailable on days that the Chuo Library is closed. (1) If you make your reservation before library opening time (09:30), you may check-out the item after Noon (12:00) of the same day. (2) If you make you reservation before 14:00, you may check-out the item after 17:00 of the same day. *Please note that the following conditions must be met in order to qualify for this service. ・ The material is available for check-out at the Chuo Library. ・ The reservation contact method must specifies e-mail. A requested item may not be made available as prescribed hereinabove due to some circumstances. Please check the confirmation e-mail before you come to the library. On The Tokuyama-ekimae Municipal Library official website, you can use the personal page "MyPage" for each customer. · You can reserve materials and chesk the waiting status of materials you reserved. · You can change the reservation receipt location and change the reservation contact method. · You can extend the term of return. · You can set "keywords" that we will deliver new arrival notification mails for books using it. · You can register / change your email address. To login your MyPage, you need a library card and a password. A temporary password will be issued at the library. The temporary password will be valid for 1 month. Please reset your password within a month. If you forget your password, or if you cannot log in, please come to the library counter. *We advise you to change your password regulary. *You do not need to login to use the Search service. We provide iPads free of charge for our users to use inside the library to facilitate search and study of our users. You can use it for up to an hour. Anyone with a library card may use this service. Please come to the 2nd floor or 3rd floor library counter for the seivice. Please note that you may not use DVDs, CDs or floppy discs nor are you allowed to print out websites. * Children 12 years old or younger must be accompanied by an adult to use this service. You may connect your PC or smartphone to the free Wi-Fi service. You may use Wi-Fi for 120 min at a time, up to twice a day. Select (SSID) "SHUNAN-TOKUYAMA-LIBRARY_Wi-Fi" to log in. Enter your own e-mail address and you can start using the Wi-Fi service immediately. You will need to login again after a certain duration of time elapses. Just press the authentication button and you will be automatically logged in and able to continue using this service. The password is posted in the building. Seats with power outlets are provided on the 3rd floor. You may use your PC to search for information. However, use of PC and other devices are prohibited at some seats. Your kind understanding and cooperation will be appreciated. The library staff is available to answer questions. This reference service not only helps you find library materials, but our staff will also refer materials and information to facilitate your research. This service aims to assist learning. You may make enquiries at the library counter. Our staff can refer you to library materials that can solve your problems. Our staff may be able to provide information to enquiries that can be easily answered. This sevice is available at the library counter and via telephone or letters. Please feel free to contact library staff. Reference seivice is available at the 3rd floor library counter. ▼ Enquiries the library cannot accept/respond to. ・School homework, questions regarding school exams. ・Experts fields such as healthcare, medication, medical, law, and patent related. ・Comments on seveys, research reports and requests for translations. ・Questions regarding personal privacy, violation of human rights. ・Other enquiries that the library deems inappropriate. To make copies, please fill out the "Copy Service Request" form and bring it to the library counter. Color: 50 Yen up to B4 size paper; 80 Yen up to A3 size paper. A copying machine is located at the 3rd floor library counter. Certain items, i.e. the latest issues of newspapers and magazines, user's manuals on CDs etc., may not be copied. Please consult the staff when applying for the service. There is a Multi-purpose Room that can be used for conferences or events. Multi-purpose restroom (Ostomate) is located on the 2nd floor. Please feel free to use it. In addition, wheelchairs, reading glasses, communication writing boards are available. Strollers are available in the library. In additon, Nursing Room (equipped with diaper changing bed, purified hot water heater for mixing formula etc.) is available on 2F. Also, there are restrooms for children. Please feel free to use them. At the Kid's library, you can read books out loud to children. There are volunteers reading books to children regulary. Free of charge to participate. Recommended Books Fair , workshops, seminars, talk events, lectures and various other events are held at the Tokuyama-ekimae Municipal Library from time to time. You may only bring in PET bottled beverages and beverages contained in capped containers (e.g. water flasks etc.) inside the library. In addition, food bought at Starbucks Coffee must be eaten only in the designated area. You may not eat packed lunch or snacks you bring with you inside the library. Please use the terrace located 1st or 3rd floor. In the interest of protecting privacy of our users, taking photographs inside the library is prohibited as a general rule. The Tokuyama-ekimae Municipal Library accept visits and tours by the administration, parliaments, universities, etc. Members of public administration should contact Shunan Municipal Chuo Library, and members of legislative bodies should contact the Secretariat of Shunan City Council. Others should directly contact The Tokuyama-ekimae Municipal Library. ・Talking on the phone is not allowed. Please keep your phone on "silent mode". ・Use of PC keyboard, sound generating electronic devices, calculator etc. is prohibited in the 2nd floor reading priority seating area. ・Pets are not allowed inside the library, except for guide dogs for the blind, guide dogs for the deaf and other kinds of servicing dogs. ・If you lose or destroy library materials, you may be required to pay compensation. ・Do not leave your belongings for long time. We may remove your items in such case. ・Parking space is limited. Please use commercial transportation as much as possible.